Well, last year (yes, last YEAR) I decided to start crocheting a large blanket for a throw at the bottom of my bed. I was going for a Pottery Barn look-a-like, warm, fuzzy, totes-pretty throw. Crocheting has never interested me (and still doesn't), but I thought I would give it a go. I only got about 8 inches into the blanket before I decided that I wasn't into it and put it away in a box. I recently found my (barely) started blank, and being the resourceful (read: crochet-lazy) person that I am, I decided to turn it into a scarf! All it required was sewing two large tortoiseshell colored buttons at the bottom of one end to make a faux infinity scarf. I was pleasantly surprised that my failed DIY actually turned out quite nice! This is not a DIY fail. This is smart. Haha. Seriously! What an awesome idea! 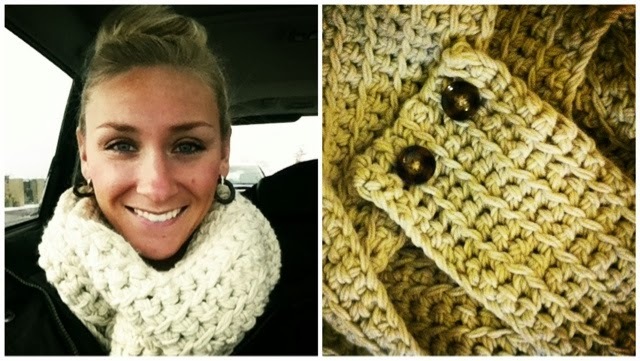 I love crocheting - its so relaxing!